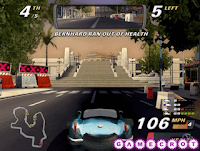 The single player part include three game modes: Tournament, which contains three different competitions: small cars race, luxury sport car race and GT race cars race. Time trial, where you race for the best time without worrying about opponents. And finally single race, where you race on a separate track of your choice. Then there's the multiplayer part, which includes two game modes: Duel, and Cop vs. Racer. It also offers various courses in a variety of cities around the world, like London, Edinburgh, New York, Las Vegas and Chicago. For a start the game graphics aren't too bad, but it is definitely not as great as it could've been. The graphics aren't realistic, which make the game less fun to play. The game's environment lacks quality, and could've been a lot more detailed. But still I have to say that the environment of the courses include a number of items like: coffee tables, street lights, cars, buses, construction cones and more, which add a lot to the race atmosphere. But still, some of those items look shallow and with too little detail, especially the traffic cars. I have to add that I liked the character design, because each of them has their own personality that reflects the car design. You can use three different driving view modes: hood view, bumper view and rear view. I know doesn't matter to some people, but I must say that the game's menu design really lacks in colors, and basically look shallow. The performance of the game in terms of graphics is good, but it does have a few minor bugs, for example some of the environment objects like the street lights often blurs. I also want to mention that the car crashing graphics are really unrealistic - for example when you crash into objects you can notice a couple of sparks of fire that looks very unrealistic. Secondly, I want to mention that I liked the idea of racing round on famous sites around the world like Buckingham Palace, the Big Ben and others. But still I only liked the idea behind the environment design and not the design itself, and that's because the lack of realistic graphics. 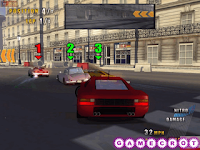 London racer 2 offers a general race game sounds which includes: great thrilling race music, sounds effects like police sirens, car sounds effects like car engines, tires, brake sounds, crash sound, environment sounds like birds, traffic sound effects and more. Along with the car radio which adds a lot to the gameplay. The one thing I really liked in London Racer 2 is the sound. When you start to drive you can listen to the radio songs and programs that can really make you laugh. The addition of the radio really makes the game a lot more fun to play. In general the game sound effects quality is average - London Racer 2 doesn't offer outstanding music/sound. But as I said earlier it adds a lot to the atmosphere. First of all I most say that the control of the car is very unrealistic and not fun to play. The car steering is very hard and tight. The artificial intelligence of the cop cars is not good either, and even has a few bugs. For example I often noticed that the cop car ran into buildings, and sometimes the cops didn't even chase me after I broke traffic rules. London Racer 2 isn't a realistic game, in regards of physics either. Speaking of which, the sense of gravity is really strange at times. For example, when you accelerate and hit some object, like cars or walls, your car rises into the air like it was a feather, and if you hit a street light it brake right out of its place like a toothpick and flies away. As I already mentioned London Racer 2 offers just a local one, including two game modes: the first one is a duel, where you race against your friend in split screen mode. 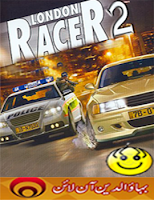 The second mode is "Cop VS Racer", where the cops have to destroy or catch up with the racer in order to win, and the racer has to survive for some time in order to win. The game offers a simple local multiplayer that can be fun for a little while.